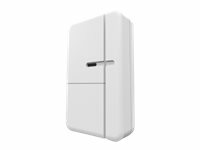 AXIS T8342 Door/Window Sensor enables the triggering of events such as notification messages, illumination, and much more, when the door or window is opened. By communicating wirelessly with AXIS M5065 PTZ Network Camera or connected Z-Wave Plus controllers, the door/window sensor can be used in small security solutions with less cabling. The wireless I/O connectivity also enables flexible installation as the sensor can easily be mounted on a door, window, or cabinet according to your needs.